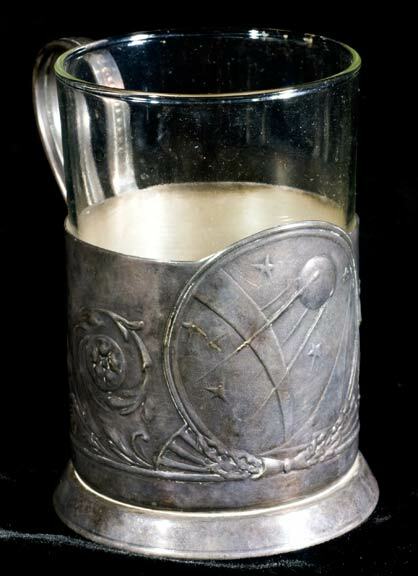 Collectors of Space memorabilia collect a variety of items, but many specialize and collect only a certain category such as: First Man on the Moon items; the original Mercury astronaut items; Sputniks and Satellites; Books on space - Scientific, Historical or Fantasy; Space theme postage stamps; Mission patches; Autographs; or Space toys and robots. Hopefully this collection will inspire and answer some of the questions about the items that have been saved or collected and expose a broad field of things to collect. 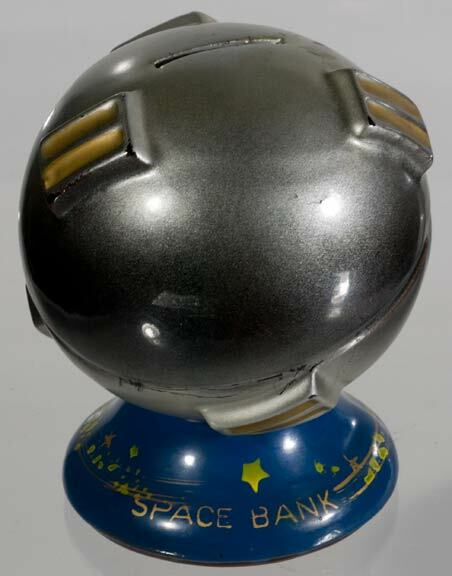 1957 Soviet Sputnik desk music box sculpture. 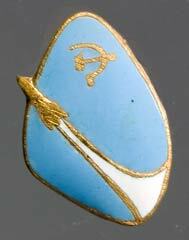 It goes "ping, ping, ping" when the key on the bottom is wound. It is about 6 inches tall. 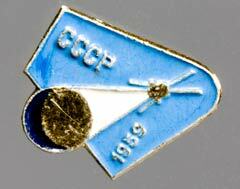 CCCP is USSR in Russian. “Ping...ping...ping...”. “Today, October 4, 1957, the Soviet Union announced that it has successfully launched a man-made satellite, called a ‘Sputnik’ meaning ‘Traveler’, into orbit around the Earth. 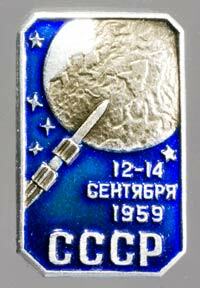 That sound you hear is the Sputnik's radio signal”. Sputnik - the first time that we heard the word, we laughed. It seemed like a funny word when the radio announcer said it. Something to do with flying saucers or such. As the American public first laughed at hearing the word “Sputnik”, the leaders of our country reacted quite differently. To them, the Sputnik was no laughing matter. To us it was the starting bell of the exploration of Man's new frontier - Space. A smaller version of the above piece that did not have a music box. The Sputnik announcement shocked the World. 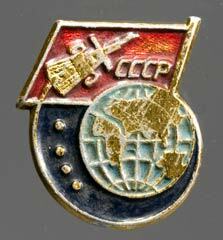 It was beyond belief that the Soviet Union could launch a 23 inch, 184 pound satellite into space and into orbit around the Earth. The world was shocked because until this announcement the United States was the assumed leader in rocket construction. 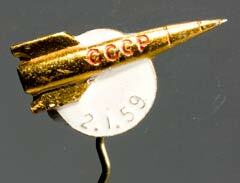 A group of Soviet lapel pins that would have been given to the men working on the launch of the Sputnik. Each is about 0.5 to 1.5 inches wide. The U. S. was working on its own satellite called “Vanguard” that it had hoped to be able to launch in the latter half of 1957 in honor of the world observance of the International Geophysical Year. The public was anxiously awaiting the news of the successful launch. Delays in the program, such as test rockets which kept exploding on takeoff, pushed the expected launch date into 1958. 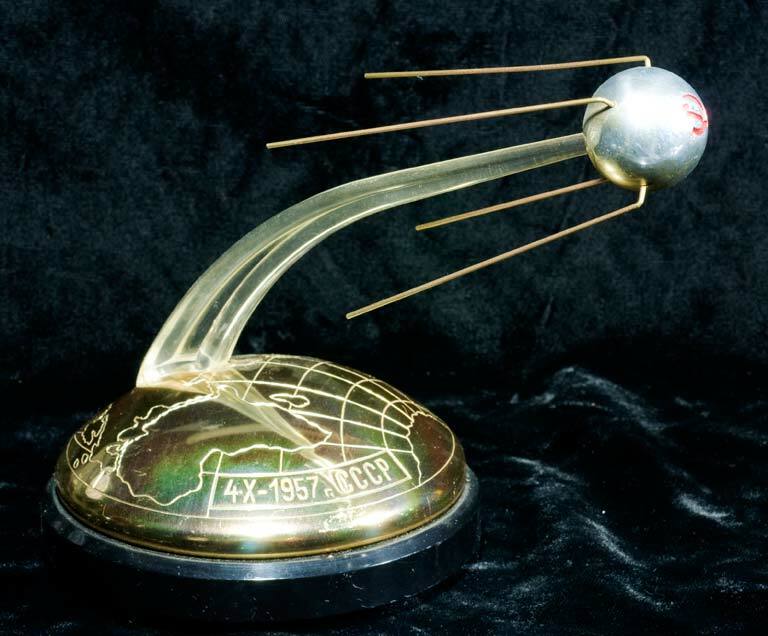 A Sputnik commemorative Soviet glass that was sold at the Brussels World's Fair in 1958. 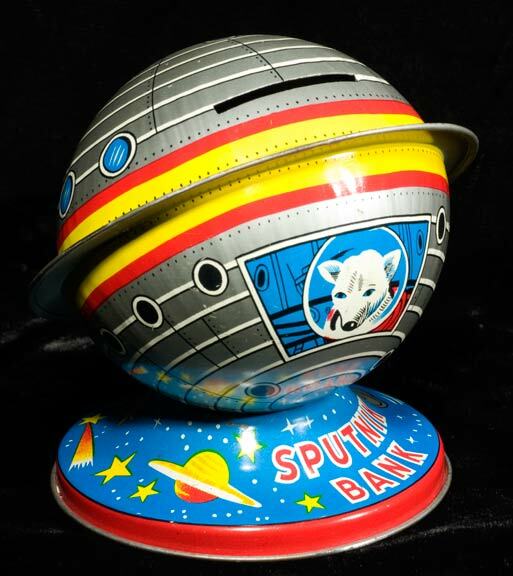 A 1958 tin decorated bank made to honor the Soviet launch of a dog, Laika, into space aboard Sputnik II. 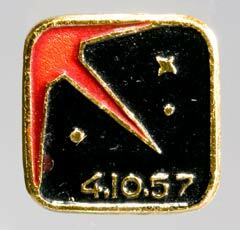 Lapel pin for the launch of Sputnik III. 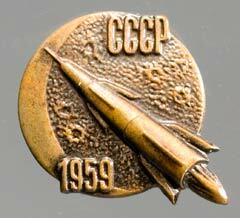 Rare Soviet button for their 1958 satellite, Sputnik III. 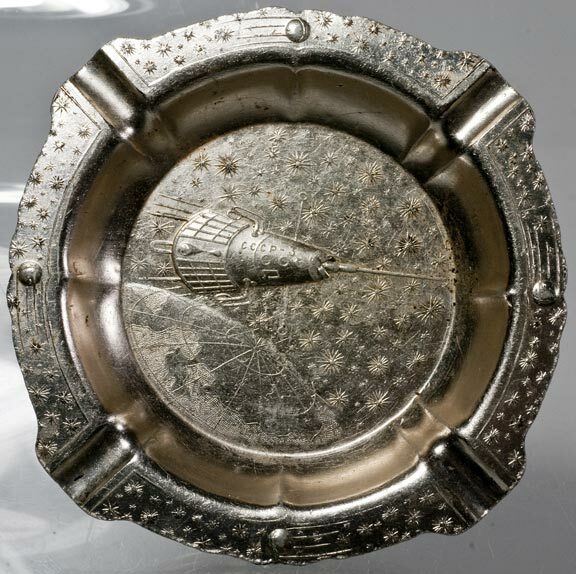 An ashtray showing the third Sputnik from the Soviet Union in the late 1950s. 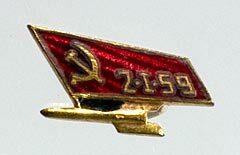 The Soviet Union was thought to be a country of peasants. How did they obtain the skills necessary to build a rocket and put their satellite into orbit without advance notice to the rest of the world? While they may have kept their secret from the public, it was not a secret from the military leaders of the United States. The Germans had, near the end of the second World War, designed and launched hundreds of rockets. The scientists who built those rockets were the prizes of war that the United States and the Soviet Union both wanted. 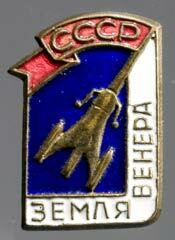 They were captured and brought back, some to the Soviet Union and some to the United States, to work on rocket design projects. Those men were the force that launched the Space Age. 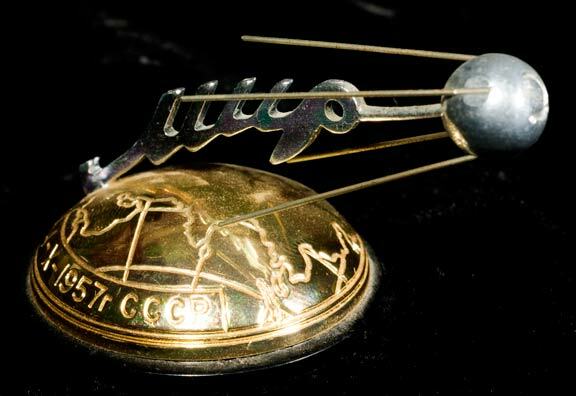 A group of Soviet lapel pins for the various flights in 1959 including Luna I, which crashed on the moon, on January 2, 1959. By the time we put Explorer 1 (6 inches wide, 6 1/2 feet long and 30 pounds) into space, the Soviets were lifting payloads much heavier than those that the U.S. rockets could carry. They also brought added interest to space shots by launching a satellite (Sputnik II) containing a dog named "Laika" late in December, 1957. 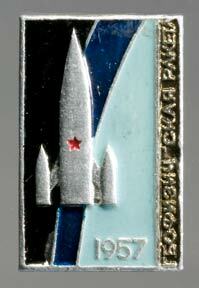 Laika stayed in space until the craft burned up reentering the atmosphere on April 14, 1958. The Soviet Union's rockets were larger. 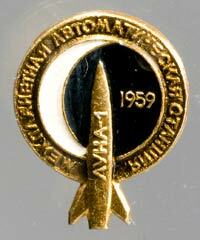 In May, 1958 they launched a payload (Sputnik III) of over 2000 pounds. 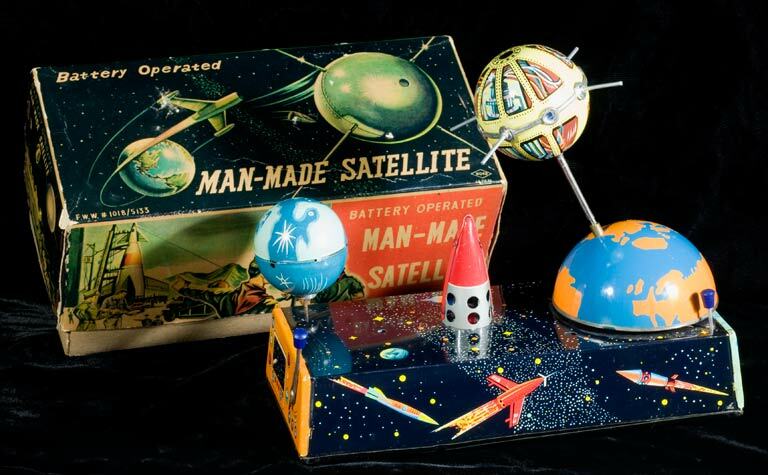 An early Man Made Satellite toy. It was tough to translate a satellite into a fun toy. 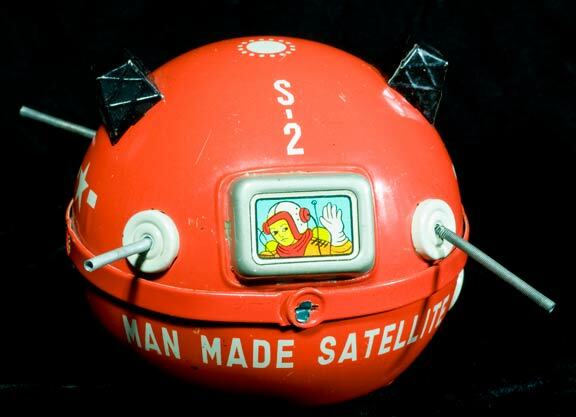 Man-Made Satellite, ca.1958. More of a piece of space sculpture than a toy. 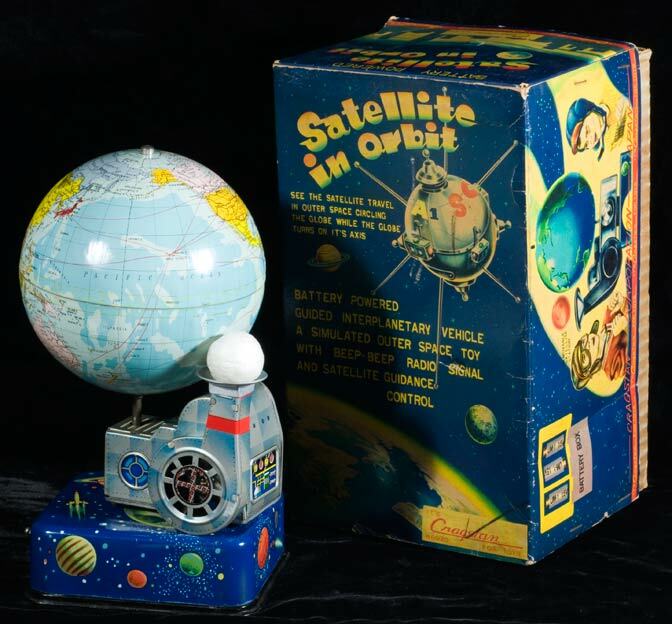 A battery operated lithographed tin toy with a satellite. The earth and satellite turn, the rocket end blinks and the whole thing beeps. This was produced for a very short time. Made in Japan by HOFU, 8.5 inches long. Satellite In Orbit, ca.1958. A great battery operated toy. The world turns and a styrofoam ball floats on the stream of air created by the little blower. Made in Japan for Cragstan by S. Horikawa, 9 inches tall. This chart can be used to help date the different space items that may be found. Books #3 on Flashlights, Picture Frames & Halley's Comet | Ghosts In The Cemetery| Waffle Recipes| Links Copyright 2008-2019 by Stuart Schneider. Do not use any parts of these pages without written permission.